Pic 1 shows the bundle that you will receive. Alternate art to ship within stay flat. Physically on hand, not a preorder. Availability: In stock, ships within 1 business day. 6th generation production that permanently solves slot compatibility issues for even the most worn cartridge slots. New and factory sealed, no insertion marks. Includes the new and unused matching serial # alternate art seen here. This space saving solution combines 161 complete Neo-Geo games onto a single home cartridge. Intuitive on screen navigation for game selection and the only multigame of it's kind ever made available for the AES. Note: This is NOT an official SNK item. Made in Canada by DGE. High quality production includes new artwork, a full offset sticker and insert, complete with foil stamping and unique numbering, along with a new snap lock case. December 15th, 2018: A long awaited restock of 161 AES arrived today. This batch is the 6th generation from DGE that provides the best compatibility to even the most worn AES cartridge slots. June 25th, 2018: DGE says that 12 copies will ship to the NeoStore tomorrow. After this batch, there will be a handful (single digit quantity) of unfilled 161 AES preorders remaining. September 29th, 2017: 10 more copies were received and shipped to preorder customers that were next in line. August 28th, 2017: Latest from DGE, "The next shipment will be soon. I'm shooting for 20-25 multi's. This will end the first board revision and new pcb's will have to be made." June 28th, 2017: 10 units were received and shipped to the next preorder customers in line. When the quantity of the next shipment is known, the next in line will be contacted for conformation of their current address. Feel free to email address confirmation in advance if you are certain that you will not be moving anytime soon. May 24th, 2017: Latest update from DGE, "I have 30 units almost complete. I have the correct solder which is now in stock. It all comes down to how many of those pass final testing." If 30 units are received in next shipment, this would fill up to order # 4035. However, the final order # cut off for next shipment can change depending on variables such as preorder cancellations & finalized quantity from this batch of 30. Because of the long delay of this production, preorders will not be repoened. If any copies remain after all preorders are fulfilled, they will be made available as an in stock item only. March 22th, 2017: As tracking shows, a shipment of 161s is scheduled to be delivered to the NeoStore this Thursday. Next in line preorder customers have been contacted to verify current mailing addresses. March 12th, 2017: Latest email updates from DGE regarding this production, see screenshots here. February 24th, 2017: DGE says that the next batch will ship out to the NeoStore before the end of this month (by February 28th). Big thanks to the diehard preorder customers for their loyalty. New preorders are not being accepted as the goal is the satisfy the existing preorder customers ASAP. January 11th, 2017: The next shipment of 161s was delayed for troubleshooting. Tracking to be provided from DGE to NeoStore and will be posted here once available. November 22nd, 2016: 10 copies were shipped to preorder customers late October. On 10/26/2016, DGE said, "I'm currently building 10 more 161's. If those pass without any new issues I will push the number to 20." As a guideline for remaining preorder customers, the next 20 copies will satisfy orders 3734 to 3813. October 14th, 2016: Update from DGE, "11 units are in testing set to leave on Monday for a Tuesday delivery. If all test well, 11 will ship. So far these new units take a lot longer to make but they are far more reliable." September 22nd, 2016: Update from DGE, "The new GFX PCB has been fully tested and it works great. One downside is the additional 14 surface mount chips that adds 80% more time to finish each game. On the plus side, the finished cart is a much better product. That 3rd PCB which has now been removed was the main part that would fail on these 161's. With all testing out of the way, believe it or not, we're now out of the hole and moving forward with this run. I'm going to build 5-10 carts and see how long they take to make now. Once those are done, I will ship them to you and also have a sound time frame on when batches of 20 will follow." September 13th, 2016: A shipment of 161s was overnighted from DGE to NeoStore and is due to arrive today, see tracking. The earliest preorders will be fulfilled today, unless there is a conflict in a reserved serial #. This 1st shipment was just a trickle, but a larger shipment is expected to follow soon after. Rest assured, DGE has enough components on hand to fulfill all existing preorders, but this is a most involving and complex production, more so than originally anticipated, and that has rendered such a production impossible & unfeasible by any other source, but also results in great value to the future 161 AES owners. 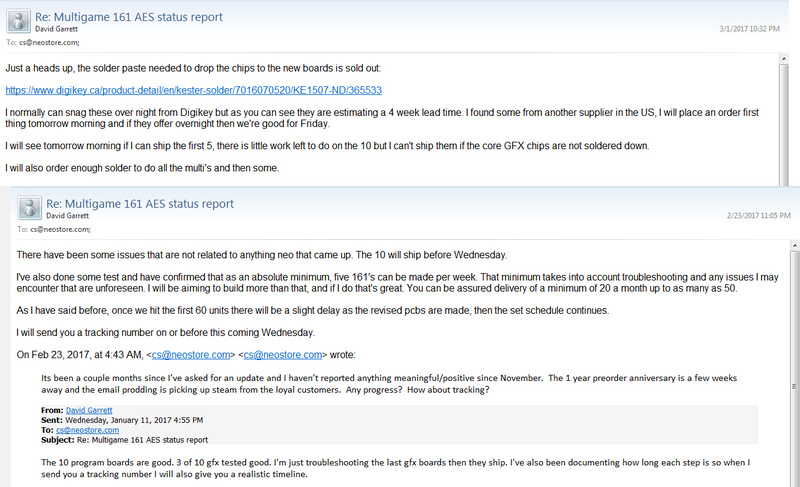 August 29th, 2016: Update from DGE: "The gfx board are not ready yet but they did guarantee around wednesday. I have had the time to triple check the design and it's sound. Once I have the pcb's in hand I will kick 10 out quick and then follow up with 20's." So, this means that the 1st 10 preorders should be filled very soon (looking to be early September), then the next 20 preorder customers sometime in September, and so on. August 13th, 2016: Detailed newsletter with full status report sent to all preorder customers. July 26th, 2016: The first batch is said to be 40 units. Another update from DGE expected in a few days as the production of the first batch finishes. Once ship date is known for these 40 units, a newsletter will be sent to all preorder customers with this update. July 21st, 2016: A firm update with quantity and ship date of first run batch to be announced on Monday, July 25th. July 11th, 2016: As with the latest Daedalus 5.0, this 161 AES production is utilizing a new PCB and a new core, but also a new audio mod on top of an already difficult build. As previously announced, the addition of a sound fix has delayed the production as these must be thoroughly tested on a per cartridge basis. Shipping estimate for the first batch is sometime in July, 2016. The next batch wouldn't be expect until after July. New preorders at this point aren't expected to ship until August or later, as the 1st 50 preorder customers must be satisfied first. June 17th, 2016: As the sound fix is being implemented to improve the quality of this production, a revised firm shipping date is unknown at this time. For now, the NeoStore's estimate is that the 1st 50 pieces of this production will be shipping early July, 2016. May 29th, 2016: A most welcome delay! The manufacturer has all parts needed and has begun production. I'm told that all future copies will benefit from a sound fix that had previously existed for the 161 MVS cartridges. An exact ship date is unknown, and the production is not being rushed. For now, the initial shipment (anywhere from 25 to 50 pieces) is expected by mid June, 2016. March 17th, 2016: Preorders are now open for the 161 AES. The 1st shipment is expected to include 50 pieces, and should ship from the manufacturer to the NeoStore by late May, 2016. Preorders will ship in the order in which they were received. The serials will continue where the last production left off, so from #29 onward. There were 183 unique restock notification requests for this item, which exceeds the production quantity! The last production for this item took place over 2 years ago. June 26th, 2014: And 1/4 of the June 23rd customers did not complete payment so the final new copy is now available. June 23rd, 2014, 7:40 AM: The 4 copies sold out 4 hours after the 3:30 AM CST restock. A used copy (copy # 12) is in transit from the owner for resale by consignment on the NeoStore, but the resale price will be quite rewarding for the preorder customer. If another production can be made then newsletter will be sent to be sure everyone is informed of such an opportunity. You can also use the 'Email me when Back-In-Stock' feature found on the right for instant notification. June 23rd, 2014, 3:30 AM: Four preorders from the original production were never paid for and after two months of no response, these preorders have been canceled and so four (4) copies have been made available. FYI, another production run of the 161 AES is likely, but when that day will come is unknown and not guaranteed. April, 15th, 2014: Production update, "The inserts and yellow insert card are done. The sticker is printed and numbered, it's now being foil stamped. Once stamped, it will be sent off to be laminated, then die cut - then we're ready to go." April 13th, 2014: Production update, “The two inserts are now being foil stamped and numbered. The stickers will be going in for foil on Monday.“ Priority is given to the highest quality standards instead of rushing the production. An exact ship date is currently unknown. Any news will be posted here. March 23rd, 2014:The pink background alternate art is now available for preorder to those who secured a copy of this Multigame AES release. 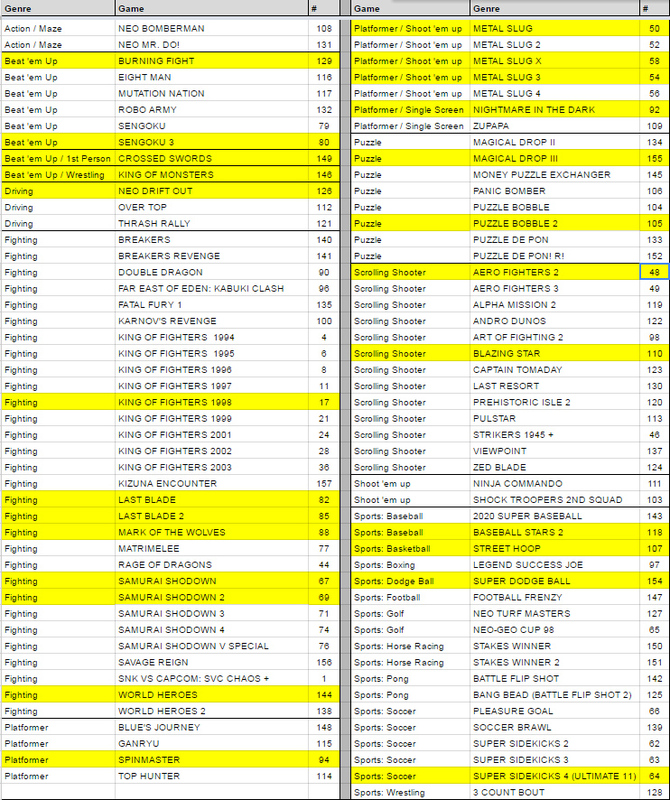 Any unsold alternate art will be made available to everyone after the Multigame AES copies are shipped. Shipping from the NeoStore to customers can be expected during the first week of April. March 13th, 2014: Interview with pubjoe, designer of the modified Terry Bogard seen in the pink version art: As you know, the image is a cheeky metaphor about the existence of these multigames. A sore topic as you know. It wasn't a serious entry, but having said that, I can see the humour in adding it in the corner as a self-aware joke. It had crossed my mind that it might be funny at the back of the booklet. To make it, I simply took parts from a couple of Terry sprites and added a bit of my own drawing in-keeping with neogeo palette. Basically, bootleg pixel-art. March 10th, 2014: Final design background color will be white. Optional design is shown in pink with alternate logo. If there is interest, then optional pink insert and cart sticker will be produced and sold separately. It's undecided if pink art pack should printed with sequential serial numbers or not, but numbering is an option. Opinions are welcome. February, 14th, 2014: $499 contest prize! Apply your creativity to design a logo for this very game! For full details of the contest along with entry submissions, visit 99designs.com. Finalists to be chosen by February 17th, so act fast. In addition to winning the $499 prize, the winning logo will be printed on the front of the insert packaging, spine of the packaging, and on the cartridge sticker. Discuss further on the Neo-Geo.com forums. The aesthetics of the hard bits and bobs are fantastic. Print quality is excellent and I can see no fault with them. The box looks and feels great. The cartridge was plugged in and worked first time. The only minor inconvenience is after booting a title, it's advisable to reset the machine to avoid some graphic bugs. But that really isn't a big deal as the user will be close to the console after switching on and changing game as it seems nessesary to switch the console off to return to the game select screen. This way of playing roms on original hardware rather than emulated may not be to everyones taste. But for anyone who values the unique features of this over the other options, I can say that you will not be disappointed with the aesthetics or build quality. It looks great among my home carts and the cartridge looks awesome in the console. I have to also applaud the inclusion of Terry's violation joke printed on the alt insert.. Very appropriate! I wanted to preorder a cartridge too in a month or two. How can I know that preorders become again available? How can I find the info about preordering time and dates? Thank you. The art, sticker and case are all the highest quality, Game play is smooth and audio is spot on. This will be staying in my collection for years and years. Thank you for putting this product out DGE and Neo Store!!! you guys rock! The description states that this item is made in Canada. The boards are being made in China. It is being assembled in Canada. I want one, could Jason find another 10 in his lockup he forgot about?